Engaging a local machine shop for your next prototypes to production manufacturing project can benefit your company in many ways. When conducting research into local machine shops, you might just discover the perfect machine shop with machining center, laser engraving or small part machining needed for your prototypes to production manufacturing venture. Here are some considerations when sourcing a local machine shop. Before deciding on the right machine shop for your prototypes to production manufacturing, it is a good idea to plan a visit to the facility. Traveling halfway across the country to inspect a potential machine shop vs. sourcing a local facility might not be in the budget. Time is money, too! Does your prototypes to production manufacturing endeavor have critical inspection points which require a hands-on inspection before proceeding? If so, sourcing a local machine shop will save thousands in transportation costs and lost time in production waiting for the inspection. One wise man once said, “you get what you inspect, not what you expect!” Traveling to a local machine shop for inspections ensures you can keep your prototypes to production manufacturing project on track and under budget. Sourcing local machine shops to complete your prototypes to production manufacturing mission should always be your first option. Whether you need a machining center, laser engraving or small part machining, JW Machine is your one-stop source. 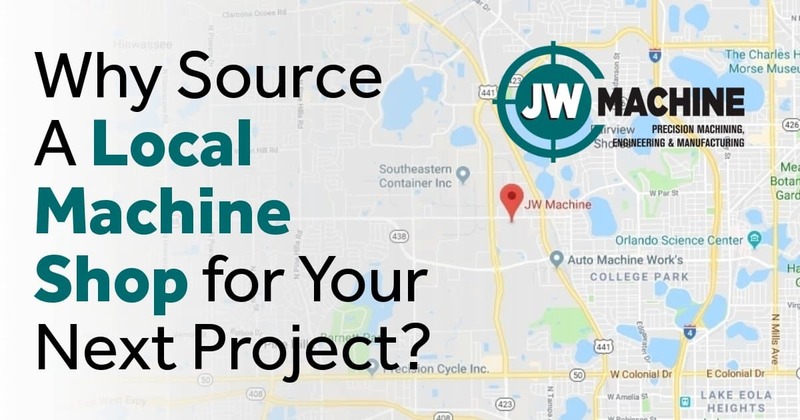 Many military contractors and high-tech industries that are part of the Florida High Tech Corridor choose JW Machine as their local machine shop of choice. Call our CNC machining experts today, we will be happy to give you a tour and discuss your prototypes to production manufacturing project.